CV/0 deleted Secondary school-leaving certificate in classical subjects (1967). Professional journalist (1982). Editor of the daily newspaper 'L'Unità' (1986-1989). CV/1 deleted National Secretary of the FGCI (1975-1980); Regional Secretary of the PCI in Apulia (1981-1986); Member of the PCI/PDS national secretariat (1986-1982); Chairman of the PDS Members of Parliament (1992-1994); leader of the PDS-DS (1994-1999); Chairman of the DS. Vice-Chairman of the Socialist International (since 1996). CV/2 deleted Town councillor of Pisa (1970-1976); Regional Councillor of Apulia (1985-1987). Member of the Italian Chamber of Deputies (1987-2004) and Chairman of the parliamentary group (1992-1994). Chairman of the committee for constitutional reform (1996-1998). CV/3 deleted Prime Minister (1998-2000). CV/4 deleted Supreme awards (from the Republic of Chile, South Korea, and Palestine). Grand Officer of the Legion of Honour of the French Republic. Secondary school-leaving certificate in classical subjects (1967). Professional journalist (1982). Editor of the daily newspaper 'L'Unità' (1986-1989). National Secretary of the FGCI (1975-1980); Regional Secretary of the PCI in Apulia (1981-1986); Member of the PCI/PDS national secretariat (1986-1982); Chairman of the PDS Members of Parliament (1992-1994); leader of the PDS-DS (1994-1999); Chairman of the DS. Vice-Chairman of the Socialist International (since 1996). 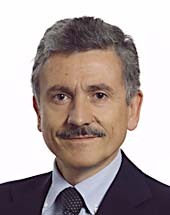 Town councillor of Pisa (1970-1976); Regional Councillor of Apulia (1985-1987). Member of the Italian Chamber of Deputies (1987-2004) and Chairman of the parliamentary group (1992-1994). Chairman of the committee for constitutional reform (1996-1998). Supreme awards (from the Republic of Chile, South Korea, and Palestine). Grand Officer of the Legion of Honour of the French Republic.